In this example, the goal of a mobile telephony network operator is to set up a model for the early identification of potential voluntary churners. This model will be the base for a respective targeted retention campaign and predicts voluntary attrition 3 months ahead. The following illustration presents its setup. The model is trained on a 6-months historical dataset. The methodological approach is outlined by the following bullets. n The input fields used cover all the aspects of the customer relationship with the organization: customer and contract characteristics, usage and behavioral indicators etc. providing an integrated customer view also referred to as the customer signature. n The model is trained on customers that were active at the end of the historical period (end of the 6-months period). These customers comprise the training population. n A 3-months period is used for the definition of the target event and the target population. n The target population is consisted of those that have voluntary churned (applied for disconnection) by the end of the 3-month period. 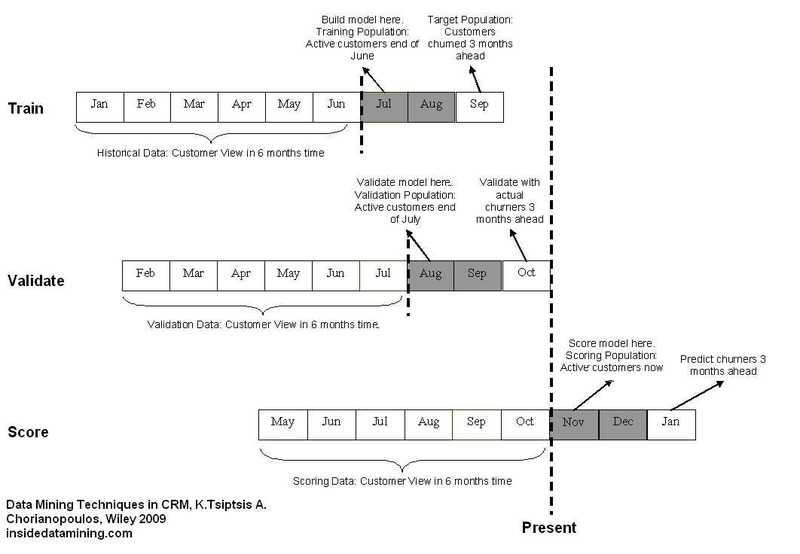 n The model is trained by identifying the input data patterns (customer characteristics) associated with voluntary churn. n The generated model is validated on a disjoint data set of a different time period, before deployed for scoring presently active customers. n In the deployment or scoring phase, customers presently active are scored according to the model and churn propensities are generated. The model predicts churn 3 moths ahead. n The generated churn propensities can then be used for better targeting an outbound retention campaign. The churn model results can be combined and cross-examined with the present or the potential value of the customers so that the retention activities are prioritized accordingly. n All input data fields that were used for the model training are required, obviously with refreshed information, in order to update the churn propensities. n Two months have been reserved in order to allow for scoring and campaign preparation. These 2 months are shown as grayed boxes in the respective illustration and they are usually referred to as the latency period. n A latency period also ensures that the model is not trained to identify the ‘immediate’ churners. Even if we manage to identify those customers, chances are that by the time they are contacted, they could already be gone or it will be too late to change their minds. The goal of the model should be long term: the recognition of early churn signals and the identification of customers with increased likelihood to churn in the near but not in the immediate future, since for them there is a chance of retention. n To build a long term churn model, immediate churners, customers that churned during the 2 months latency period, have been excluded from the model training. n The definition of the target event and the time periods used in this example are purely indicative. A different time frame for the historical or the latency period could be used according to the specific task and business situation. 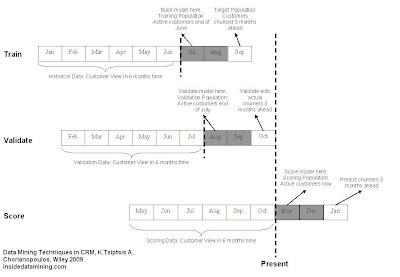 Source: Data Mining Techniques in CRM. Inside Customer Segmentation, K. Tsiptsis, A. Chorianopopoulos, Wiley 2009.